The duodenum is not only an important part of the gastrointestinal tract, but also works as endocrine portion by secreting some hormones that play roles on the regulation of some organs. The present study was aimed to study the histological and histochemical patterns of duodenum in dromedary camels. Therefore, specimens from eleven dromedary camels (Camelus dromedarius) of both sexes at different ages from 2-12 years were examined. Masson�s trichome and H and E stains were used for general histology and mucicarmine was used to stain mucin. The present findings revealed that, the camel duodenum is formed of four layers, tunica serosa the outermost layer, tunica muscularis which is composed the inner circular and outer longitudinal smooth muscles, tunica submucosa which composed of network of loose connective tissue, blood vessels, lymphatic nodules and duodenal glands and the innermost layer which is composed of the lamina mucosa, lamina propria and lamina muscularis. The lamina mucosa is composed of simple columnar epithelium with enterocytes, goblet cells, Paneth cells, enteroendocrine cells, lymphocytes, stem cells and intestinal glands. The lamina propria is composed of loose connective tissue, vascular and lymphatic vessels and scattered smooth muscles. The lamina muscularis is composed of smooth muscles. The mucin is found at the duodenal glands, intestinal glands and goblet cells of camel duodenum. However, the mucin is also in all parts of camel duodenum with gradual reduction from upper part to the lower part of the duodenum. Conclusively, the complete structure of camel duodenum showed that mucin was present in all parts of duodenum. The dromedary camel (Camelus dromedaries) occupies a prominent position among other animals in Saudi Arabia and all over the world. The camel is ruminant, but its stomach differs morphologically from that of other ruminants1. The gastrointestinal tract was found to be the largest endocrine gland in the body in term of both hormones and number of endocrine cells2. The duodenum is responsible for further processing of the material from the stomach by secreting enzymes which are vital for digestion; it also mixes the digesta with these enzymes within its lumen3. The primary functions of the small intestine are digestion and absorption. This is achieved by mixing of the food with digestive enzymes secreted from the endocrine glands3. The camel gut has the most rapid proliferation rate in the body due to the dried and cores feed4. In domestic animals the small intestine is divided into three parts: duodenum, jejunum and ileum. The three regions of the small intestine share a common histological pattern with some special characteristics of each part. Their wall from outside to inside consists of the serosa, the muscularis, the submucosa and the mucosa5,6. The present study was undertaken to characterize further histology of duodenum of the camel. The tunica serosa covers the entire small intestine and it is an extension of the peritoneum and consists of a single layer of flattened mesothelial cells overlying loose connective tissue3. Animals: Eleven dromedary camels (Camelus dromedarius) of both sexes, from Alahsa slaughterhouse and Camel Research Center, King Faisal University, College of Veterinary Medicine and Animal Resources were used in this research. The animals and specimens were apparently healthy and free from gross pathological changes. The animals age ranged between 2 to 12 years7. Methods: Small segments of duodenum were collected from eleven adult camels, immediately after slaughtering at Alahsa slaughterhouse or in the Department of Anatomy, College of Veterinary Medicine and Animal Resources, King Faisal University. 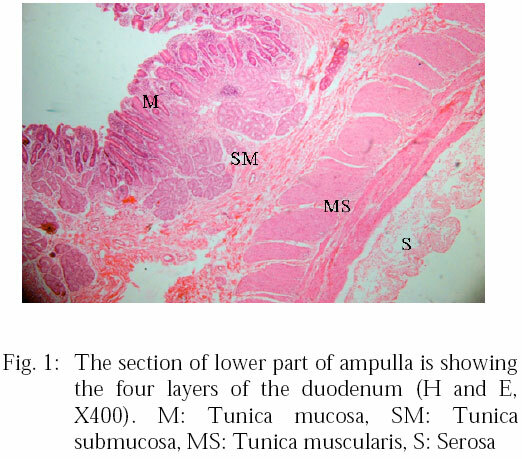 The samples were collected from the proximal and distal parts of the ampulla of duodenum. The samples from the thin part were collected from five regions: proximal, proxo-middle, middle, mid-distal and distal. The samples were fixed in 4% paraformaldehyde in PBS for 30-40 hours at room temperature for routine histological techniques. The samples were trimmed to small pieces about 1.0 cm in length and processed by routine histological and immunohistochemical techniques. After fixation, the specimens were dehydrated in ascending grades of alcohol, cleared in xylene and embedded in paraffin wax as blocks. Serial sections were taken from each block at 5-7 μm with Leica rotary microtome (RM 2135, Wetzlar, Germany). The sections were floated on warm water bath (41°C). The sections were mounted onto uncoated glass slides for routine histological techniques. Sections for histological techniques were then cleared in xylene and rehydrated in descending grades of alcohol, washed in distilled water for staining8. Three different histological staining techniques were performed in our laboratory as follows: heamatoxylin (Ehrlich) and eosin (H and E) stain for general histology, Masson's trichrome stain to differentiate other inclusions of the duodenum9 and mucicarmine stain for mucin10. Stained slides were examined under light microscope (Olympus BX51, Tokyo, Japan). The duodenum was formed by four layers, from outside to inside, the tunica serosa, tunica muscularis, tunica submucosa and tunica mucosa (Fig. 1). 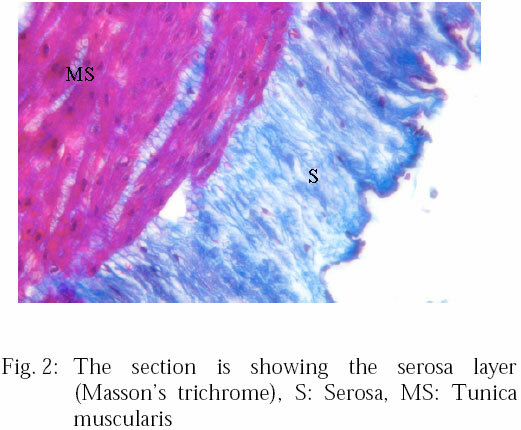 The tunica serosa was a single layer of flattened mesothelial cells covering loose connective tissue (Fig. 2). 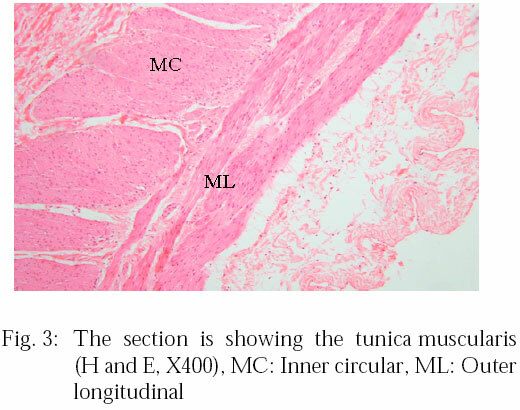 The tunica muscularis was composed of inner circular and outer longitudinal layers of smooth muscle (Fig. 3). 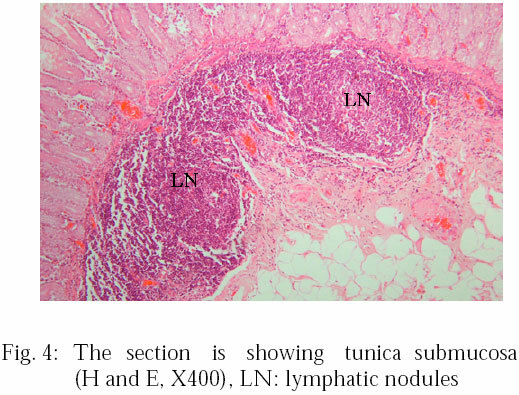 The tunica submucosa was composed of network of loose connective tissue; blood vessels, lymphatic nodules also found along the duodenum (Fig. 4). The characteristic component of this layer was duodenal gland (Brunners glands) (Fig. 5) which was abundant in the upper part of the duodenum and decreased in number at lower part. However, these glands were scattered through this layer. Their secretory units were very obvious. The ducts of these glands were connected to the lumen of the duodenum. The tunica mucosa was composed of the lamina mucosa, lamina propria and lamina muscularis. The lamina mucosa was composed of simple columnar epithelium which lines villi and crypts (Fig. 6). The epithelium contained different types of cells, each cell have specific function. The cells that were found in the epithelium: enterocytes which were a single layer of columnar cells "absorptive cells" which have a striated border (brush border), goblet cells were scattered in-between the columnar cells of the villi and crypts, Paneth cells were found at the base of the crypts, enteroendocrine cells were scattered at the base of the columnar cells, lymphocytes were found close to the surface of the columnar cells, intestinal glands (crypts of Lieberkühn) were found at the base of crypts, stem cells formed the majority of cells at the base of crypts. Mitotic figures were also found close to the base of the crypts. The lamina propria occupied most of the tunica mucosa. The lamina propria extended through the core of the villi and it was composed of loose connective tissue which formed the framework of the tunica mucosa, vascular and the lymphatic vessels were found mostly in the core of the villi and some scatted smooth muscles (Fig. 7). The lamina muscularis formed by smooth muscle, was found immediately beneath the crypts. The mucin was found mainly at the duodenal gland (Fig. 8), goblet cells and intestinal glands. The mucin of the intestinal glands was only shown at upper part of duodenum. 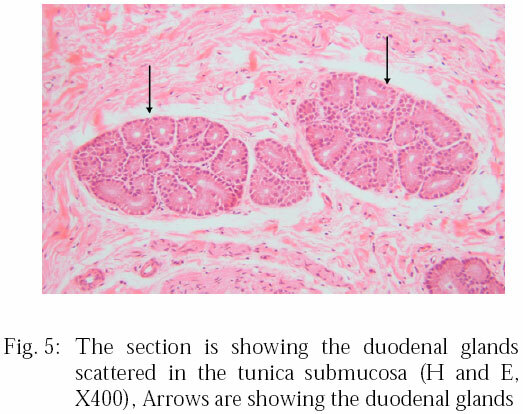 However, the mucin was found in all parts of the duodenum with gradual reduction in the staining intensity at duodenal gland only from upper part to the lower part. 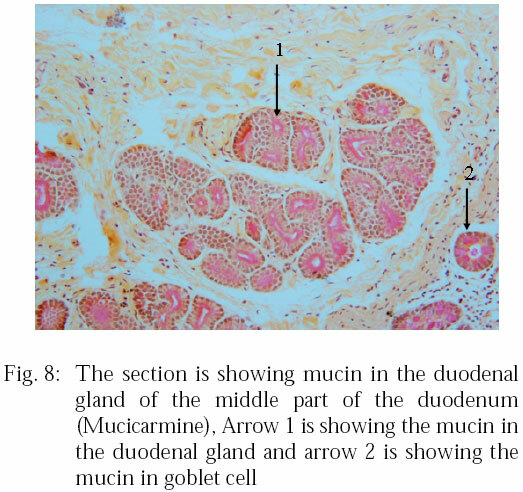 However, the mucin in goblet cells did not show reduction compared to the duodenal glands. This study clarifies the layers (tunics) of the camel duodenum. The camel duodenum was formed by four layers, from outside to inside, tunica serosa, tunica muscularis, tunica submucosa and tunica mucosa as reported by earlier8,11,12. The lymphatic nodules scattered in the submucosa were demonstrated along the duodenum of the camel as in other domestic animals8,13. The characteristic feature of the camel duodenum was the tubuloalveolar duodenal glands which was abundantly scattered at the upper part of the duodenum but disappeared toward the end of the duodenum and beginning of the jejunum. Therefore, the distribution of these glands was confined to the duodenum. These glands were only found in the tunica submucosa of the duodenum of other domestic animals11,14. However, the duodenal glands were distributed in the submucosa for approximately 2 meters caudal from the pylorus in the two-humped camel15. The tunica mucosa was composed of three layers: lamina mucosa, lamina propria and lamina muscularis. The cells that were found in the epithelium were: enterocytes having striated border (absorptive cells), goblet cells, Paneth cells, enteroendocrine glands, intestinal glands, lymphocytes, stem cells which forms the majority of the cells at the base of the crypts and mitotic cells to renewing the sloughed cells as shown in other domestic animals5,16,17. 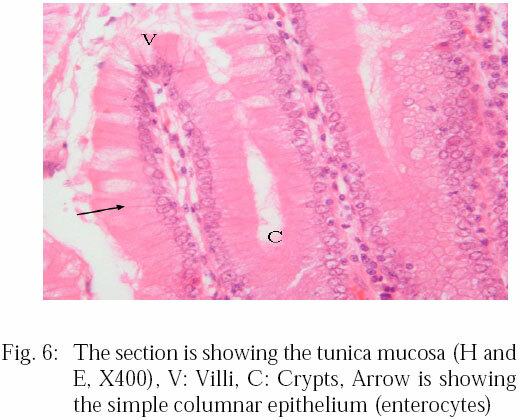 The lamina muscularis was a smooth muscle layer separating the tunica mucosa from tunica submucosa, which is consistent with the literature18,19. However, this layer of smooth muscle was penetrated by the ducts of the duodenal glands. This study shows that mucin was secreted from three sources: goblet cells, intestinal glands and the duodenal glands of the camel duodenum. It was reported that the pH of the abomasal content in camel was higher than that in bovine20. Therefore, the duodenum was expected to expose a potential damage from acidopeptic secretion emptied from stomach21. However, the secretion of these cells and glands will form a layer of mucus that forms a slippery, viscoelastic gel that lubricates and protects the mucosal lining of the proximal intestinal tract14. The mucin was secreted from all parts of the duodenum. However there was a gradual reduction in the duodenal glands from upper part to the lower part. While in the goblet cells, the mucin was not reduced, which suggest that, the pH decreased from upper to the lower parts and the need of mucin was for lubrication of the lumen. However, the mucin secretion can be stimulated by the hydrochloric acid discharged from the stomach22. Moreover, the mucin can be stimulated by inflammatory mediators23. Generally, the mucin was believed to protect the duodenal mucosa from the acidity of the chyme and lubricate the lumen of the duodenum. The present study illustrated a complete diagram of microscopic structure of the camel duodenum and figured out the presence of mucin secretion in the duodenum of the camel. The Camel Research Centre has kindly provided experimental animals. Dellmann, H.D. and J.A. Eurell, 1998. Textbook of Veterinary Histology. 5th Edn., Lippincott Williams and Wilkins, Baltimore, USA. Junqueira, L.C., J. Carneiro and R.O. Kelley, 1995. Basic Histology. 8th Edn., Prentice-Hall International Inc., Appleton, Lange. Thomas, A.B.R., 1988. Relationship Between Physiology and Clinical Disorders of the Small Intestine. In: Principles and Practice of Gastroenterology and Hepatology, Gitnick, G., D.N. Kaplowitz, L.M. Samloff and L.J. Schoenfield (Eds.). Elsevier, Amsterdam, pp: 281-289. Ramadan, R.O., 1994. Surgery and Radiology of the Dromedary Camel. Al-Jawad Printing Press, Kingdom of Saudi Arabia, ISBN-13: 9789960270241, Pages: 360. Bancroft, J. and A. Stevens, 1982. Theory and Practice of Histological Techniques. 2nd Edn., Churchill-Livingston, New York, USA., pp: 131-135. Carson, F., 1990. Histotechnology: A Self-Instructional Text. 1st Edn., ASCP, USA., pp: 124-125. Bacha, W.J. and L.M. Bacha, 2000. Color Atlas of Veterinary Histology. 2nd Edn., Lipincott Williams and Wilkins, Philadelphia, PA.
Shiner, M., 1995. Anatomy of the Small Intestine. In: Gastroenterology, Haubrich, W.S. (Ed.). Vol. 5, WB Saunders Company, Philadelphia, pp: 885-898. Young, B. and J.W. Heath, 2000. Wheater's Functional Histology. 4th Edn., Harcourt Publisher Limited, USA.